It was a very unusual start for a trip. In a long time, the first time I wasn’t traveling for business. 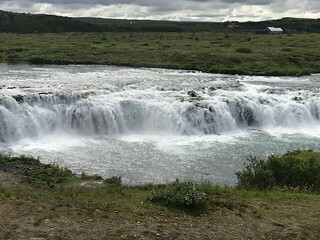 Just recently they introduced a daily flight from Cleveland to Reykjavik. At home we have talked about it, soon after which My daughter, Emily brought home a book from the library about Iceland, and a few days later she started telling people that I’m taking her to Iceland. I had no idea where she got the idea from, but we talked about it with my wife, and it sounded like the perfect vacation idea. As always, I checked if there was a money museum there, and sure enough, there was one. A few weeks before we left for Iceland, I sent an email to the Numismatic Museum, which is part of the Icelandic National Museum. In a couple of days I got a response that our family is welcome to attend a tour at the Museum at the time of our choosing. This was very generous, especially because we found out that the museum’s curator, Mr. Sigurður Pálmason came in to meet us during his vacation. I am ashamed to admit, though originally I planned to, I did not learn much more than yes and no in Icelandic. However, it was also interesting to find that there was no time when I needed Icelandic. As soon as people figured out that we weren’t local, and probably it wasn’t a difficult guess, they switched to fluent English, and it was very easy to communicate. Mr. Pálmason for example apologized for his English, but I don’t think it was any worse than mine after living in the US for many years. And in general it wasn’t anything unusual. It was nice to hear the language though on the streets in real life, it gave me a better idea of what it really sounds like. It fascinated me how this little country can provide all the necessary knowledge people need. Just for a comparison, a little more than 300 thousand people live in the country, a bit more than half of the people in Cleveland. Outside of the country, not many people speak Icelandic, yet, they have everything a large country has. Schools, at least one university I know of, parliament, stores, banks, entertainers, authors, translators, radio operators, DJs, news broadcasters, and of course, many tour guides. We visited the museum on the third day of our stay, hoping to give the kids a couple of days to adjust to the time difference. Asking to learn about local coins was the best idea. The museum has some 5000 artifacts, but what we have learned about the money of Iceland I couldn’t have found anywhere. Before the trip, I tried to find some information, I mostly read related articles on Wikipedia and in the Krause Catalog. I did find a list of coins and most notes, but it was nothing more than a list. I have to say, it didn’t even sound interesting, and I was a bit worried what is there in Iceland, as they only introduced coins in 1922. 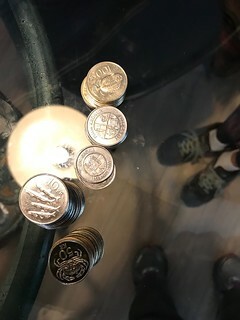 Before that, they used Danish coins according to the resources I found, but we learned from Mr. Pálmason that it was more than that, they had all kinds of different Scandinavian coins, the museum even has a Swedish plate money. Iceland started to use its own currency earlier, in 1886 they started issuing bank notes, this is when “Iceland” started appearing on currency, so when the first coins came out the Icelandic Krona already existed. Iceland had three sets of coins, but interestingly after 1944 when they declared independence from Denmark, they did not issue new coins due to the shortage of metal after World War II, so the old coins with the crown were used until the 1970’s, when new coins were issued. In 1980, a new set of coins became necessary when the Icelandic Kronur was devalued after a heavy inflation. A new inflation hit the currency after 2008, but it wasn’t as big as the previous one. I had a chance to touch all the coins used in circulation before the current sett. I did get the current coins from the stores before we visited the museum. Needless to say it was the first thing I did. Since I didn’t have too many coins from Iceland, and even those have doubles, the current set of coins were new to me. There are some very nice, large, easy to identify coins. Not only the designs are easy to tell apart, but the edges and sizes are also very distinct. After an overview of the Icelandic coinage, we also got an introduction to the bank notes. We found out that all kinds of different notes were used, three entities officially issued bank notes, the largest being the Bank of Iceland, which was a private entity. Notes came in all colors. People at the bank signed each note individually. The largest bank note originally was a 50 Kronur, which was worth many months of salary at the time. Thus, very few survived, because people used them. There is only one note in private collections, in the bidding war on an auction the price went up so high that some people decided to buy it together to split the costs, and each one of them now holds the note for one year and passes it on. After the overview of the currency of Iceland, we found out that Mr. Pálmason is working on a project to digitalize the holdings of the museum to make it available online. I am happy to find that more and more museums take this approach. Consequently, if done well, much more information will be available to blind people this way. It was a fascinating visit. I did not detail here all we have learned, but Mr. Pálmason gave us a very interesting and detailed introduction to the currency of Iceland, the museum is absolutely worth visiting, and we haven’t even seen the majority of the objects. But I am convinced again, that the best way to go is to ask local people about local coins, which they value and understand thoroughly. Another museum which I would highly recommend to anybody.